The Teacher Spotlight series hopes to shed light on the characters behind the Art League. The ones who make our classes possible, who inspire your children, and instruct you. Once a month we'll be profiling a teacher so that you can learn a little bit more about the community behind the West Hartford Art League. 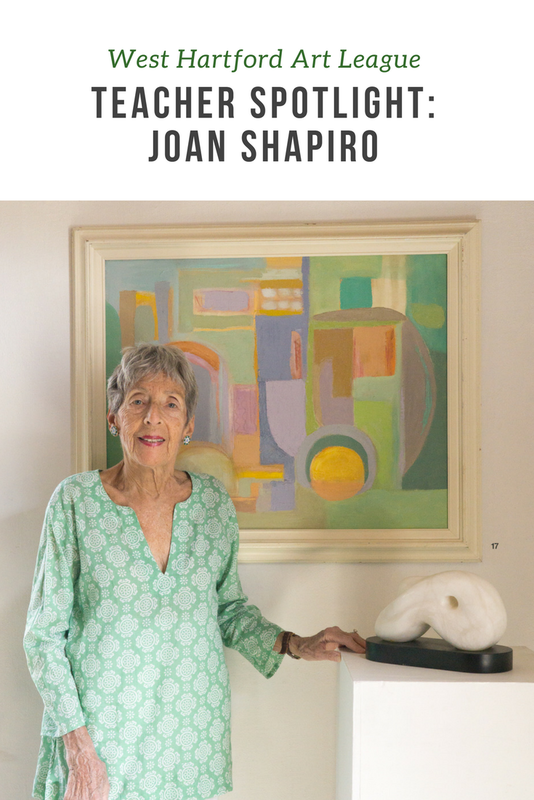 This month we're featuring Joan Shapiro, a long time teacher of the Art League (42 years in fact! ), West Hartford resident and active artist. Tell us a little bit about your artistic journey. I have been an artist since I was a child, around age 13 probably, a long time. Growing up I was just an average student, but I did enjoy artistic expression. And when I entered high school, and really became involved in the arts. My fraternal twin sister was the one who was very helpful in noticing my creativity and supporting it. I got more support from my sister than from anyone in the family, and I was very appreciative of that. When it was time for me to apply to college, my father said he wouldn't pay for art in college unless I could prove that I could be employable. So I took some advertising classes. I didn't really want to, but I figured I could at least fake him into that. I started at Lasell Junior College, where I had an instructor who told me that I belonged in a University and with her help I worked hard on my academics, and we put together a resume and an art portfolio. At the end of my second year, I applied to Boston University. I was accepted and did three years there in the School of Fine Arts and loved it. At the end of senior year I started looking for a job. I interviewed a little but no advertising agencies would hire me. I had a friend who knew someone in the textbook publishing business, and she thought they needed an illustrator. So I set up an interview and I met with editor, and he offered me a job in 1961 for $75 a week. That was a lot of money in those days! So I worked for 11 months. At this point I was 22, and I went to a wedding, and a couple at a table from Connecticut asked if they could set me up with a boy they knew. I said sure, so I came to Hartford and we were fixed up and that was it. Ben was my guy, and he loved that I was creative and involved in the arts. I was very fortunate because he was the one who kept pushing me to stay in the arts field because that's who I was. He gave me enormous support. So we met in August, got married in April and I moved to West Hartford in 1962. How did you first get involved with the West Hartford Art League? It was through several friends. They asked if I would give art classes to their kids. I told them that I'm not a teacher, I just have an art background. They asked me to think about it, and I went to the University of Hartford Art School Library, got a library card and took home books on art education. I looked through them all and thought I could do it. So I called the girls back and said okay. They rounded up 10 or 11 kids, and the kids came over and I taught them in my house for several months. Then word got out that I was teaching this class and someone from the West Hartford Art League called me and said they heard that I'd been giving classes, and asked if I would be interested in teaching there. So I came over to the little Schoolhouse and interviewed. It just made so much more sense than doing it in my house. I started and loved it and I've been here ever since then. How long have you been teaching here and what classes do you teach? I've been teaching for 42 years now. I've always taught mixed media because I like teaching drawing, water based painting, collage and clay. I also teach stone sculpture. I show the kids how to use the rasps and files to sculpt their stone. There is a lot of physical labor involved. We're not using a hammer and chisels, but you have to learn how to use the tools properly. I think what the kids discover with the stone, is that their hands are totally responsible for making what they create. It's not done by a machine, it's done by their 10 fingers and their perseverance. The kids love it, though sometimes they get frustrated because it takes a lot of work and time. Because it goes through the process of shaping and filing and rasping and then sanding and polishing, it takes many hours to complete. But when the kids have a finished piece and they've polished it, they are so excited and amazed. What’s your favorite thing about being involved with the West Hartford Art League? I think, to work with the kids primarily. When I see kids get excited using their hands, if they're really concentrating and getting into it, it's like nothing else exists in the world. I feel that way myself when I get really into something. And if they feel a sense of great pleasure and achievement, it doesn't matter if its a drawing, watercolor, collage, clay, stone, the excitement that I see in their faces and the way they respond, that's a high that I can't buy in the store. I feel a thrill and that never dies. What type of art do you personally create? I personally still do paintings, both oil and acrylic, and I like working with all kinds of collage materials. I try everything. I've never been in one tunnel, I'm all over the place. What do you wish other people knew about the West Hartford Art League? I hope they know that there is quite a diverse group of instructors, an enormous range of classes, and that you really have to come over and investigate them. Two or three people might be teaching a painting class and you really have to find out which is the one that will be the right person for you. This interview has been shortened and condensed for editorial purposes.